NGP VAN is a technology provider to Democratic and progressive campaigns and organizations, offering clients an integrated platform of the best fundraising, compliance, field, organizing, new media, and social networking products. "Great and getting better every day!" NGP VAN has the flexibility to handle every single component of a political campaign. If you need to send your volunteers and canvassers door-to-door across the state, VAN has the tools you need. Hosting a fundraiser and you want to make sure everyone gets a thank you note and also generate your state campaign finance report? VAN can do that. You need to develop an issue advocacy program between election cycles? VAN can do that. Mass emails to you supporter network? Distributed phone banking? Event rsvp's? VAN has you covered. And if VAN can't do it directly, they almost always have an API ready to go with someone who can help fill your needs, whether that's an robo call system through Callfire, advocacy tools through Revere, or texting through Hustle. The interface can sometimes be a bit clunky, since there is almost always more than one way to do the same thing. Training documents aren't always readily available, which makes it difficult to train a large campaign staff. Most of the industry users I know have learned this software on the job, and have little or no formal training on the software. NGP VAN is great, but make sure that your sytem administrator is at least somewhat familiar with the system before you try to implement. I've used NGP VAN to win multiple campaigns over the years. Without this one simple system to track all of our constituent contact and manage all of our supporter data, I don't think those campaigns could have been successful. "The Gold Standard for Democratic Campaigns"
It is one centralized place to log and keep tabs on everything I need as a Campaign Manager. When it comes to fundraising, it is easy to build and maintain files on my donors and targets. It is great to log information about those who our campaigns brings aboard as volunteers, including how often or recently they are being used to avoid over use and burnout. When it comes to Campaign Finance Reporting, NGPVAN allows me to enter in the information specific to my reporting requirements and the program does my work for me. When it comes to filing time, my treasurer's life is a breeze. NGPVAN really provides a medium for our information to be stored and accessed so that I can be confident that nothing is slipping through the cracks and we are staying as tightly organized as we need to be. The newest interface (NGPVAN 8)is sometimes not the most user friendly when it comes to running call time and logging data in real time as compared to previous versions. Talk to others who have used the product/are using the product and let them show you the application of how easy it is. You will be amazed by the utility of it. It is the easiest way to log all of my campaign data in one place, no matter if it is coming from fundraising, volunteer activity, or some other sphere. Everything is in one place and easily organized. What Political Campaign solution do you use? "Older versions of NGP remain intuitive"
In the older versions of NGP I've used, the interface is very intuitive and easy for beginners to pick up. Simple to moderate functions can be done at ease without much training. Newer version of NGP, along with Direct Connect, are practically the opposite of intuitive and are incredibly difficult to use, leading to a lot of time wasted trying to figure out simple tasks, or just easily avoidable mistakes. Also, some of the more advanced functions of NGP are difficult to pick up on and not very obvious without a comprehensive tutoring session. NGP is central to the work we do everyday managing the finances of a number of political candidates and groups. NGP makes producing call sheets incredibly simple, and you don't appreciate how good it is until you have to make call sheets from scratch, an incredibly tedious job which can take hours without the intuitive NGP software. Also, compliance work is very simple through NGP, a few clicks of the button does a job that would otherwise entail weeks of dealing with snail mail or hundreds of pages of printing. "So many holes in the fabric..."
The voter database is updated frequently from the NE Secretary of State. But unfortunately not frequently enough. Too many times over the years have I called a number and spoken to a widow or widower. Or called the same constituent lead only to have my eardrums almost blown because it's still a fax after years? How hard is it to update the database from canvasser feedback about call disposition? R Votes is far more antiquated. NGP VAN seems to be the only viable option. Benefit is easy connection with voters. When they are reached. Virtual phone banks are just life savers. Being able to have everything you need in one place when on the phone with people is absolutely priceless. Also cutting turf for canvassing/ building maps is easy and great. If you are pulling people based on models, they are not always super helpful. Of course, statistical models are inherently not perfect, but sometimes you need HUGE volunteer/staff capacity to actually touch all the people that you pull based on models. This is not NGP VAN's fault per se, but I wish they were a little more helpful. It's also sometimes hard to work with State Voices, who runs c3s use of the VAN. Civic engagement! It's not great at identifying brand new people to engage in high-level ways (ie new volunteers), but it's perfect for very broad outreach. It's also helpful for volunteer management of people you already work with. "An essential service for any Democratic Campaign "
The interface is really user-friendly and I love the ability to see if people in my network have voted when it gets close to election day. You can train someone with little or no VAN experience in a matter of days. VAN makes recruiting and maintaining volunteers a breeze. I wish I was able to have the "My Campaign" tab and "My voters" tab open in the same browser. VAN has crashed on me a handful of times which can be frustrating when working long hours and getting close to election day. I would recommend attending an NGP VAN training webinar to get a full grasp of it's capabilities. NGP VAN is the premier service when it comes to mobilizing voters for political and issue campaigns. There is no other service that compares to NGP VAN and I would highly recommend it to anyone who is trying to strengthen their field program and win electoral campaigns. I look forward to using NGP VAN in the future and hope other field programs will as well. NGP VAN is a crucial tool for any campaigner or organizer to track voter contacts, volunteer recruitment, and fundraising information. It is an excellent tool for multi-member campaign teams who can span wide geographic ranges. Sometimes mycampaign is clunky - there are better SEOs like Salesforce that help you seamlessly schedule appointment and track client interactions, but it is helpful that the platform is all in one place. NGP VAN is THE tool for managing your field campaigns. It updates in real time, helps to track IDs and target campaigns, and ultimately sets you up to win. "The best option but still flawed"
NGP is the best way to run a campaign. It is the backbone to everything I do as an organizer, and the campaign motto is often "if it isn't in VAN, it isn't happening." I think it is relatively user friendly, a wonderful way to organize a campaign, and a powerful tool for event planning and large-scale field work. NGP VAN does many things very well, but it could benefit from talking to the people who use it and asking them what they need. For example, data entry is not easy to do. Similarly, the default options when searching for people, looking at data, or making events are never the options real people would use, and there is not an easy way to save the correct options as the default. My entire job is basically scheduling, calling, and organizing people with VAN. Nothing we do in the field part of my congressional campaign would be possible without VAN. "NGP VAN for organizing and volunteer recruitment"
I was able to verify voting locations as well as target specific locations for canvassing. Also with the information gathered it made it more streamlined to cut turf.With the input functions for canvassing results could easily see totals and percentages individually or across the region(s). It was frustrating that for lower levels of access that you don't have the export capabilities for mail merging. Also, many of the people in the database didn't match with the search criteria, this may have been from faulty input and not a VAN issue. Pay close attention to details and ask questions during tutorials/orientation. Inevitably you will learn a lot on the job but a basic overview is necessary. I can easily design a search with filters to Target specific demographics and engaged individuals. "All the features, none of the simple workflow"
I like how specific I can get regarding entries - the multitude of fields, the exactness of entries -- and I like how easy it is to see contact history with someone. I absolutely hate the search functions. The workflow is so awful, if my boss tells me "pull a list of donors, in the Bay Area, who've given $250+ in the last two cycles" it is like reaching around in the dark. Especially in the old NGP, but in both -- I have to try 5 searches, because it's not intuitive, until I finally get something I can use. There should be a descending tree workflow to searches, like this but not this, plus this etc.... If NGP had a search workflow akin to NationBuilders (who's software I honestly can't stand) it would be perfect. Do not get cheap and be okay with your client's campaign using the old NGP software. Make sure it's the NGP2 edition. Your life will be easier. It keeps everyone on the same page. Everyone can see what's happening in real time. "As good as its users"
Van relies on a multitude of voter info to pertain the most relavant of campaigns for them. You can then compile lists of relevant voter databases to support your script. Users can update voter databases with inaccurate information. Its up to responsible users to correct the database upon discoveries of immaculate information. You can't break van. Its already peripetually breaking and it's up to you to fix it. I am constantly making van more effective each time I update a voters information and I help the action fund I'm part of by increasing their voter files when I identify voters that support our csuses. It makes entering new information about voters, and pulling specialized lists seamless. I could only imagine what a nightmare organizing campaigns would be without it, or another product like it. I have no real complaints at the moment. From a data perspective, I do sometimes worry about the quality of data that is going in. The 2-factor authentication is also extremely frustrating. We use votebuilder for elections. It has been a great way to keep the voter file organized, and allows counties and precincts to coordinate their own efforts easily. We wouldn't win elections without it. "Easy to use for first time user"
I like that NGP VAN was easy to use as a first time user. I started working on it as an intern and found it very easy to pick up for fundraising purposes. I think that the user interface of NGP VAN is a little bit clunky and not intuitive. It can be complicated to navigate through if you do not know what you are looking for. We use NGP VAN to aid in our event planning and fundraising efforts. It helps organize donors and helps to target our donors for certain marketing. All campaigners know VAN is the gold standard, whether you like it or not. It's great to have predictive dialer, virtual phone bank, mini van, list building, all those things in one system. Every action and Van are essentially the same, they should just be the same. In our last campaign we constantly had to duplicate events in VAN for internal tracking and EA for public facing events. Our use was distributed so there was also a lag time in getting some features turned on, even just exporting lists. Working within a coalition, again it's the gold standard whether you like it or not. In the campaign world it would be unthinkable to try any other system. The plus side is that it's a very transferable skill set. 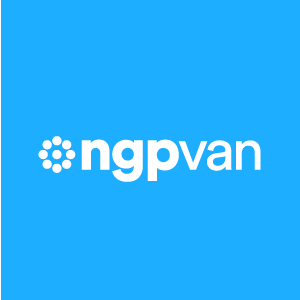 NGP VAN is a user-friendly tool that gives me access to data for voter outreach and canvassing. NGP VAN can be difficult to log in to an often requires me to confirm my identity by getting a code texted to my phone. NGP VAN allows me to be more strategic when it comes to voter engagement. I can reach constituents I know turn out to vote. The tool allows me to seamlessly filter by party affiliation, gender, affinity to vote, etc. which helps when formulating our campaign strategy. "Every campaign's bread and butter"
VAN is the primary voter contact tool for any Democratic campaign. It's fully integrated with a mobile canvassing app called MinIVAN, that lets volunteers pull up data on voters, knock on their doors, while syncing that data back to the campaign database in real time. It's unbelievably good software. I don't really dislike too much about it. Volunteering for the Doug Jones campaign in Alabama, we were in an uphill battle against the Republican party. NGP VAN, and its miniVAN app in particular, helped us contact hundreds of thousands of voters in a very short time. The beauty of the VAN is its ease to use for first-time users and also its MiniVAN app. No more long nights of data entry, save your time and volunteers for what works - actual voter contact! If an area has a lack of good voter files to upload from the SecState, the data is less reliable. It saves on manpower hours and puts staff/volunteers into direct voter contact, which is much more effective and cost saving. The best thing about VAN is how secure it is. Once you’re logged in it’s incredibly easy to access voter contact information, cut turf, track dials and so much more on this app. I’m amazed by the amount of things it can accomplish. I appreciate the levels of access there are (field workers, volunteers, HQ all have their own type of access). Being logged out for a short span of inactivity. I like that it is easy to track membership involvement, create a searchable calendar of events, and create phone banks that are specific to targeted populations. I haven't found a way to have multiple tools open at the same time. For example, information about a member and the event screen. It has really produced the ability to grow membership for our grassroots organization at the national and local level seamlessly. This has also proven instrumental in obtaining data regarding the percentage of invited vs attended members to our events. "A quick and easy way to reach voters"
The ease of app use. The minivan app provides a simple way to go through voter rolls for local campaigns in particular. The user interface, namely visually. Nothing is wrong with the apps outright functionality, but the interface could use an update. Reaching local voters to both determine support for political candidates, but the platform also presents a good way to gauge citizen sentiment on pertinent issues. "Best campaign software out there"
VAN is the best tool out there when it comes to making field more effective by integrating grassroots voter contact with technology. Its smart canvass tools, the VPB and MiniVAN, allow volunteers to spend more time on the doors and on the phone while simplifying data entry (and reducing the time it takes to a matter of seconds). VAN has a great user interface that makes it easy to use for any volunteer. There are a few things that could be improved with VAN. First, a more profound integration between social media & digital advertising and its CRM tool would be an incredible bonus. Second, certain tools within the system such as report formats and form letters (without NGP) are clunky and could be improved. It is a great product for any grassroots campaign. VAN has helped us win an election and empower volunteers and campaign managers all across the country. It has allowed us to collect more data and build more powerful models. "Used for political campaigns "
NGP Van was a full source software that provided the needs for all of my clients and successfully helped me address their needs. What I liked best was being able to rely on NGP for just about everything I needed for fundraising efforts. It is a high tech software that is necessary for any political fundraisers. With NGP I can do everything for my client without leaving the program; serve all their needs at the same time. I also think NGP has a great tech service and has been helpful in resolving many of the issue sI have some across. I also appreciate how flexible the hours they have expecially in times to submit forms. I dislike the complexity of the program. it is hard to use at first and not very user friendly at first glance. I attempted to self teach the program to myself, and could not. I had to ask a friend to show me how to use the program. My other dislike is with the call sheets, and the limited options. It is frustrating that we cannot create our own call sheet that can specifically meet the needs of our clients. It is a great program to use but you need to use customer service when/if you have questions, they are very helpful. The business problems I am working on a re specifically tied to the needs of my clients, which is building a clients fundraising network. NGP corners the market on best voter data and is a great tool for any campaign. Their website and communication tools have seen a vast improvement over the years and are relatively easy for new users to understand and use successfully. NGP has somewhat of a monopoly on voter data and their user packages are priced way too high especially in a state that has campaign finance laws that limit the amount of money raised and spent on a campaign. If your campaign has the financial resources then you should definitely purchase it! You can't beat their data! We use extensive voter data to target voters on a campaign, whether it be for door-to-door canvassing or direct mail outreach. NGPs data is far and above the cleanest most up-to-date voter data on the market. "NGP used by finance committee for Congressional race"
NGP allows us to keep all of our donors organized. Keeping track of donations and donor information. NGP VAN's VoteBuilder platform is a sophisticated, state-of-the-art method for tracking interactions with voters. Depending on what data your campaign has access to, VoteBuilder makes it possible to target voters most likely to support your campaign and then to track every interaction you have with them. There are limitations to their database and the data that you have access to depends on what you purchase. The system can be a little confusing for new users to learn, but that's mainly because it is so feature-rich. It really is the gold standard for democratic campaigns. I believe, however, that part of the agreement means they get to keep any data your campaign harvests. It's worth investigating that if ownership of your data is a chief concern. VoteBuilder makes it easy to create targeted lists for phone banks or door-to-door canvassing. You can target voters based on their party, voting history, age, gender, specific issues they've indicated are motivating factors, and more. Additionally, you can create and assign codes specific to your campaign -- attendance at a certain event, answer to specific questions, etc. The result is an exponential improvement over simply flipping through the phone book. Your campaign saves time and energy by focusing efforts on the right voters. And it enables you to track these voters over time, staying in touch up to election day. "Used it for inputting political research and assisting with call time, along with data input." I like that everything is available through one platform. Through NGP Van I can create emails, track donor information/history, print call sheets and do just about everything I need to, to help a client succeed financially. It's great being able to go to one platform for everything. When I first started using the program, I self taught myself most things. NGP Van has one of the best tech support systems and training systems that I have used. If I ever was confused or having issues, their tech support was extremely reliable in helping get the issue resolved. In addition, I enjoy the updates that were made between NGP Van 1 and 2, especially with the Group codes and attributes that appear with automatically when inputting contact information. When first using NGP Van, it can be extremely confusing but the tech support is there to help with that. My main frustrations came with the search features for contacts. I think their needs to be more options of the way you can look up contacts and also select them so you can easily create news lists and groups by searching. This is small thing and is has not caused me to dislike NGP Van but it could be changed. My other issue is the options of Call Sheets. For my clients, it would be nice to be able to create my own specific Call sheet formula instead of using pre-selected options. Or if that is not feasible, it would be nice to be able to make a request for a format of call sheets. Clients all have very different needs and preferences, and by being able to create a call sheet that fits that it will help me better serve their needs. This is a great program if you are looking for a platform that you can do the majority of your fundraising and networking through-all in one is the best feature about this software. i use NGP VAN mostly for assisting clients in fundraising efforts and managing political campaigns. The largest benefit is having everything through one platform and database and being able to use it for just about everything. "Great for every aspect of database needs on political campaign"
I wish it was more shortcut friendly. When I am entering 50+ checks at one time, it'd be nicer to be able to fly through using my keyboard more than the mouse. Contribution organizing and data keeping. When used for a campaign, the system provides a lot of information and capabilities, but can be cumbersome to use, especially for new users. There are other products that are easier to use. The system can be extremely cumbersome and is expensive for small campaign organizations that don't need all the features. This system was used on a political campaign. The reason it was selected was for its ability to integrate accounting and basic field functions. For a large campaign it is worth it, but for small, local campaigns it is too expensive and too burdensome. "Donor/client research upload and compliance/quarterly filing." The best part of NGP is the ability to download contact/client donor lists. It can be complicated to upload/find information about specific donors. You have to go through several tabs to even get to where you need to be. All of our client donor info is centralized which is a benefit for us and we are able to track call time/donations that come in to each campaign. "The only way to organize. " As the preeminent liberal political organizing suite, NGP VAN is outstanding! Frequent updates means a constant learning curve. But the updates make the service better. NGP VAN is the foundation of our operation. We couldn’t function without it. "Field Team for Local and State Campaigns. " I like that NGP VAN is extremely user friendly and is very connected between all of its uses. Every so often there are glitches regarding the data input. Sometimes the data that it presents is not actually what was input by the user. NGP VAN is extremely effective for campaigns with a large team where everyone's data inputs are synced together for analysis. The ease of campaign finance reporting is great with this service, however, it's very easy to make duplicates of contacts. Easy to duplicate contacts and there is a limit to how many sections you can pull when generating reports. There are other platforms that you could use, but NGP VAN is the most cohesive for the money. It's a lot easier to keep track of pledges and donations. One of the easiest campaign platforms to use. "It has some positives but definitely could learn from some other softowares like Organizer." It is very good at breaking down large group statistics and making them easy to read and analyze. It is excessively difficult to identify individual numbers and analyze the effectiveness and accountability of each canvasser. Try to keep script and questions the same and set activist codes and survey questions in the results tab to make analytics easier. I felt very well equipped to manage and contact my voters. I found that in initially recruiting volunteers, working outside of VAN produced more meaningful connections with potential vols. Somehow VAN produced less personal contact. I don't have a resolution for this, but that is my observation. I started with no vols and then I had vols. Problem solved! Very powerful set of tools for calls, emails, and a database. Their website tools are lacking. Also, its social media integration is poor--the features either aren't there or aren't user-friendly. Searches are also unnecessarily complicated. Expensive but worth it if you use all the tools. Email, donations, website pages, and CRM. "A paper saver and campaign basic"
VAN was crucial for our campaign once we started having paid walkers. We could literally just send them a link or ID number and they could just go! I have nothing bad to say really. It didn't really drain my battery much. We saved costs on paper and printing, and we also had a more accurately recorded database. The site was easy to use and made keeping track of people in my network, scheduling, and packets all in one place much easier. Different layouts between tabs and various form entry. Maybe too many screens to complete actions. Used for auditing of various forms, creating turf and packets, sharing data amongst entire organization. "NGP VAN was easy to use and helpful for canvassing large territories." NGP VAN made it easy to navigate with their map showing locations of houses and the amount of people within each house. I could plan the best and most efficient route fairly easily. Much of the data was not accurate or updated. It has made canvassing more efficient and allowed greater grassroots initiatives. "I've used NGP VAN for numerous campaigns"
The ability to cut walking lists/phone banking lists and organize contacts is very helpful. I love that VAN allows me to create tags for volunteers and voters, it makes it a lot easier to narrow down searches. I wish that I was able to have multiple tabs open at once. VAN makes it easy to prioritize and target certain voters. Easy to navigate and make changes within the database. Hard to consolidate multiple entries (ex. donors). We used ngp van during a political campaign. We were able to handle information from over 70k constituents. It was great for working with large amounts of data. "Overall a good experience with NGP 7! " Mini VAN. It makes canvassing much easier and streamlined. It also ensures you don't lose data due to weather or lost paper. The duplicated contact information. There are a lot of profiles that are useless and take up space and time. Finding what voters are interested in within a give geographical location. It gives you a chance to contact those you need but it takes time to sort through the useless, raw data. There are models available to overlay on the voter file. Great integration for phone banks and minivan for canvassing is getting better and better. Good integration for fundraising and field. Clunky format. New users have a tough time slicing targets from big lists. Voter files used to be excel sheets (if you were lucky) from the clerks / secretaries of state. NGP VAN changed all that. Keeps track of all data, which is sent directly to Campaign management. Very organized, easy to find locations. Can freeze from time to time, and reroute you randomly. Data entry, makes it more efficient. "Works well but is expensive"
I like that there is a lot of space for multiple contacts. The site itself is very slow, and very costly. Ease of putting contacts in one central place. I’m not solving any business problems with it. There are no benefits. Hate or love VAN it has voter outreach down to a science. It can at times be glitchy and redundant..
Running targeted and micro targeted outreach. * We monitor all NGP VAN reviews to prevent fraudulent reviews and keep review quality high. We do not post reviews by company employees or direct competitors. Validated reviews require the user to submit a screenshot of the product containing their user ID, in order to verify a user is an actual user of the product. Hi there! Are you looking to implement a solution like NGP VAN?